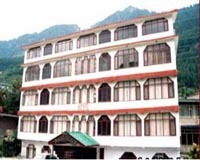 Brightland Hotel is a nice 3-star hotel that offers a pleasing stay in Shimla. Set in a peaceful environment, the hotel overlooks the splendid mountains and pine trees. The interiors of the hotel reflect a perfect amalgamation of traditional decor and modern accessories. The hotel offers excellent accommodation, besides providing hospitable services. Brightland Hotel has all the facilities, required for a comfortable and hassle free stay on a visit Shimla. Airport 20 kms, Railway Station 0.5 km, Roadways Bus Stand 0.5 km.